Eating my way through London and abroad! What’s the first thing you think about when you wake up every morning? For me, the very first thing that comes into my head (Well, apart from – Cant I just have five more minutes of sleep?) is breakfast! There’s nothing better than waking up to a good breakfast, whether it be a pain au chocolat from the local bakery, a pancake from the crepe stand on the way to work or if you’re lucky the ultimate morning treat – A Full English! – Essentially, man’s best friend… Utterly scrumptious and a great hangover cure. When I first heard about Colbert at Sloane Square, I truly thought that all my prayers had come true. A really cute French cafe that not only serves breakfast all day but is practically round the corner from where I live. A place where I would be able to walk in late on a Sunday morning, sit down and have a nice relaxing breakfast – good eggs, friendly waiters and great atmosphere. Sounds perfect, right? Well, it was far from it! We arrived there at around 1:30 (quite late for brunch, I know) and the place was packed! Every table was full, including the cute Parisian ones outside and there was a line of people waiting out the door! It was crazy… Amongst all the people waiting for a table and the waiters frantically running about…. Trying to find the man at the reservations desk was like finding Wally. We were told that it would be a half an hour wait for a table in the bar area or outside. Neither were a good option, the bar area was extremely hot and stuffy, where waiting people stood crowded, hungrily staring over those eating in the squashed booths. As for outside, well the tables are really cute, but only good for a quick coffee; just too small and too close together to be able to eat a meal. By this point, we were too hungry to go elsewhere for lunch and so just decided to put our name down and patiently wait. What can you do? It was either that or waiting over an hour and a half for a table in the main section, I think not! After about 25 mins of waiting and having witnessed the reservation manager give a table right away to some friends of his, who walked in, we were starting to get a little pissed off and decided to complain. Finally, we were offered a table. Surprisingly, it was in the main section and were told we could eat there as long as we were done in an hour and a half. It turns out this table and two others had been empty for at least fifteen minutes, but hadn’t been offered to anyone cause they were booked for 3:30. What is wrong with this place? With the amount of people waiting…. They can’t afford to have empty tables just lying about. Plus an hour and a half for breakfast at a place like this is more than enough! We sat down and ordered some fresh orange juice and a pain au chocolat to share right away. Our waitress was really nice, a foreign lady whose name I couldn’t pronounce, and brought our drinks and croissant within minutes. However, when we asked if we could order, she told us, that she wasn’t allowed to take the food order and someone would be with us shortly. That someone didn’t come for another ten minutes…. We kept trying to signal to the man who seemed to be taking all the orders in the area, but for some reason he kept writing us off. Gosh, if they want us to be out of here in an hour and half then they need to atleast take our order! At one point when we tried calling him again, he actually came right up to our table, pointed his index finger in our faces and rudely said, ‘I’ll be with you in just one minute!’ As if telling us off, like naughty children. Finally, a few minutes later, he reluctantly came to our table and took the order. He was snappy and short and quite frankly, acted like he was doing us a massive favour. What on Earth is happening in the food service industry? The food didn’t take too long to come, but luckily in the meantime we had the pain au chocolat to nibble on. The pain au chocolat was very decent. It had a great flavour, nice buttery dough, and the chocolate in it was perfect, just the right balance of darkness and sweetness. However, the downfall of this classic French pastry was that it wasn’t nearly as flaky enough as it should have been…. For me, the most important thing about a croissant/pain au chocolat is the crispness of it. It needs to have that lovely, light flaky outer layer and be really soft and doughy in the middle. Overall, not a bad attempt, though. At last our food arrived. Together, we had ordered, an eggs florentine, a portion of scrambled eggs with chives and Comte cheese (which came with toast) and a goat’s cheese salad with dried apricots. All the food was brought out at the same time, and the waiter, neither the grumpy man or the nice lady, said that our toast would be out in ‘just in a minute’ with a selection of preserves. Just to let you know, we had to ask three more times before our toast and preserves eventually came, at which point we had long ago finished our eggs! The first thing I noticed about our food was that, instead of getting eggs florentine we had simply just gotten egg florentine (singular) Normally, eggs florentine is a dish of two toasted English muffin halves, each topped with a bed of spinach, a poached egg and coated with a good spoon of hollandaise sauce. 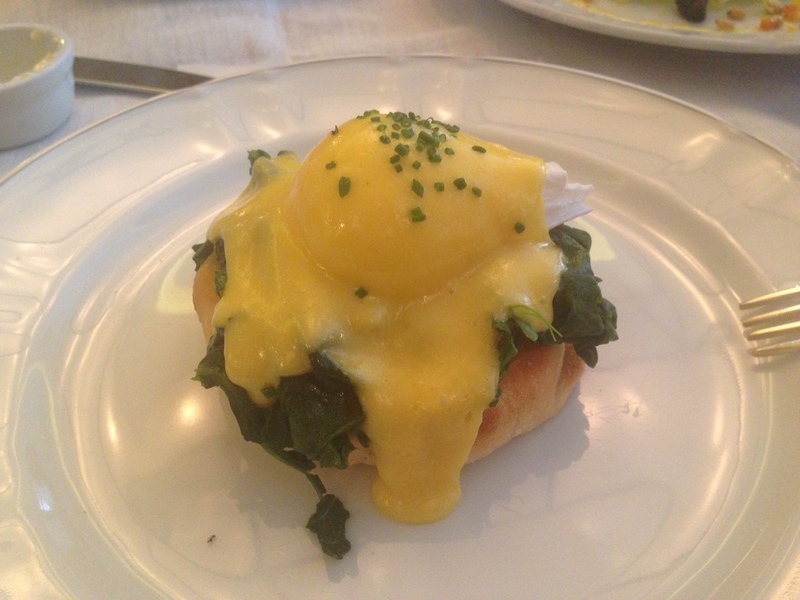 However, what our rude, order-taking waiter failed to mention was that the eggs florentine at Colbert comes in two sizes- the normal two eggs or simply just one! He forgot to ask us which size we wanted, and so just brought us the smaller portion. We decided against complaining, firstly, because seriously, what was the point at this stage and also because the one egg florentine that we got was much larger than the usual. This dish wasn’t very good. The English muffin bottom was far too thick and therefore became slightly soggy when topped with the spinach, the poached egg (although beautiful looking) was overcooked to the point where the yolk was almost half set and the hollandaise almost seemed like it was on the point of curdling…. Way too thick and not nearly as velvety and luxurious as it should be. 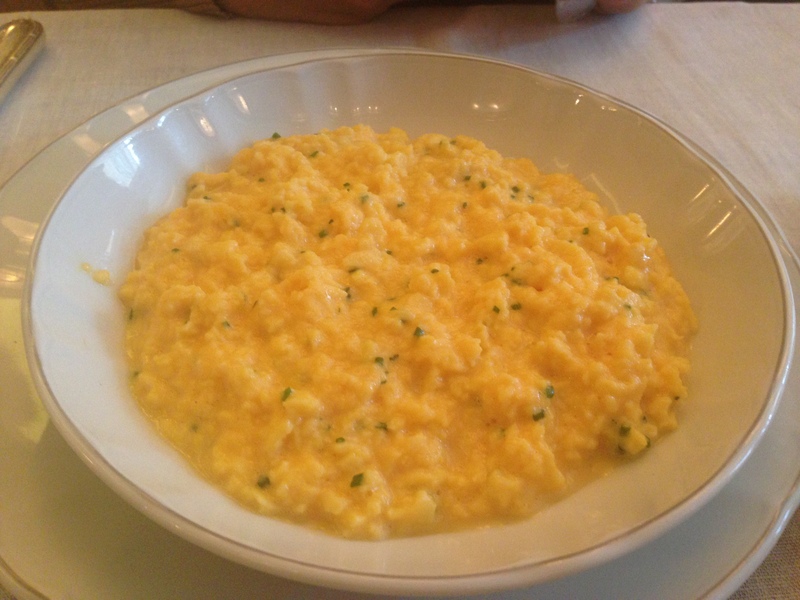 On the other hand, the scrambled eggs were quite good. Creamy and light with lovely threads of stringy, melted Comte cheese through it. (For those unfamiliar, Comte is a French, semi-hard, cow’s milk cheese. The milk is in pasteurized, thus giving the cheese a complex flavor with nutty/caramel undertones.) I must say, the eggs were very well made and would have been thoroughly enjoyed, had they not come to us practically cold…. Yum! Lukewarm eggs and lack of toast! According to me, the best dish was the goat’s cheese salad. Out of the three, the only one I’d order again (Although, considering the experience I had, I doubt I’d be coming back anyway) This dish was really good, just up my street. A nice, big, round slice of soft goat’s cheese placed under a hot grill and served with salad, lovely dried apricot pieces and roasted pine nuts. Delicious. The thing that I liked most about this salad (I’m not entirely sure if you can call this dish a salad considering it barely had three pieces of lettuce… But anyway,) was that before grilling the goat’s cheese, they had sprinkled a little bit of sugar on the top thus giving the cheese a lovely crispy/sweet bruleed top when done. I just loved this! It’s so different from every other goat’s cheese salad I’ve seen and it seems to work brilliantly. The bill came to 37 pounds including service. Quite pricy, but considering the type of place and location, I can’t say I’m surprised. The thing that disappointed me the most about Colbert, well apart from the rude waiters and unsatisfactory food, is the fact that it has so much potential and instead of enhancing it, they’re just wasting their time pushing overpriced food at as many tourists as they can find! 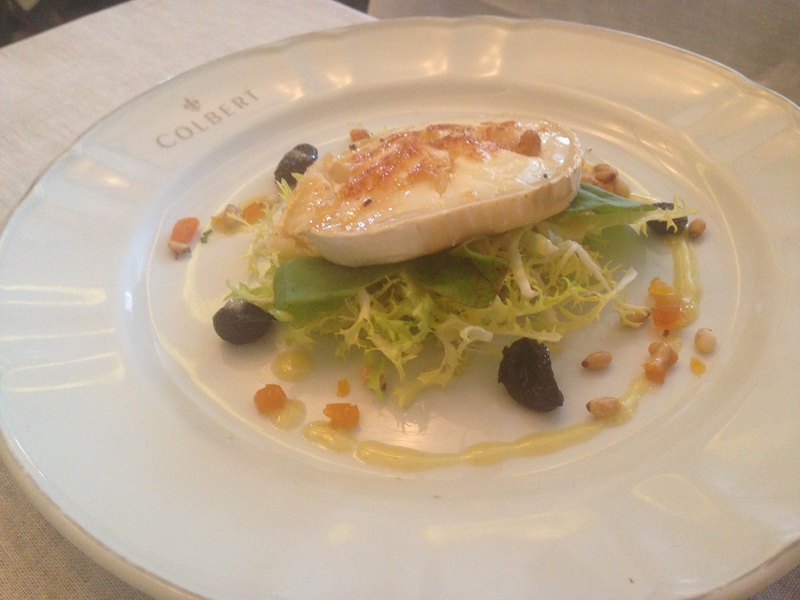 It’s just so unfortunate, Colbert really has so much to offer: prime location, great ambiance, lovely Parisian cafe menu… And much more. And I firmly do believe that with a little work and effort the food can be really great too!